The Shoffner Act, introduced by state senator T. M. Shoffner of Alamance County and passed in 1870, empowered the governor to suspend habeas corpus and use militia to restore order in counties where Ku Klux Klan terrorism raged out of control. Governor William W. Holden invoked the act that year to suppress the Klan in Alamance and Caswell Counties, igniting the so-called Kirk-Holden War and leading to Holden's impeachment and removal from office. Argument in the impeachment trial of W.W. Holden, governor of North Carolina: full stenographic reports revised and corrected. Available from http://digital.ncdcr.gov/cdm4/document.php?CISOROOT=/p249901coll22&CISOPTR=282344&REC=1 (accessed August 3, 2012). 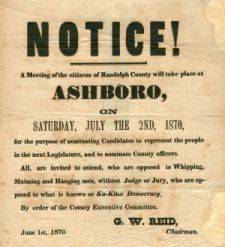 Broadside published by the Randolph County Executive Committee of the Republican Party on June 1, 1870. North Carolina Collection, Call Number Cb329.1 N87r. Courtesy of UNC Libraries. Available from http://www.lib.unc.edu/ncc/ref/nchistory/jun2006/notice.html (accessed August 3, 2012).